Generally, the EBN is a set of UI elements that are built as a tree where each element is anchored to its parent element. Generally, a control loads EBN files through the VisualAppearance.Add method. Each EBN loaded has an identifier that goes from 1 to 126. The control provides BackColor/Background properties, to specify a different visual appearance for different parts of the control. The identifier you choose for the skin / ebn is important to be used in the background/backcolor properties. The background/backcolor properties uses 4 bytes ( DWORD, double WORD, and so on ) to hold a RGB value. More than that, the first byte ( most significant byte in the color ) is used only to specify system color. if the first bit in the byte is 1, the rest of bits indicates the index of the system color being used. So, we use the last 7 bits in the high significant byte of the color to indicates the identifier of the skin being used. So, since the 7 bits can cover 127 values, excluding 0, we have 126 possibilities to store an identifier in that byte. This way, a DWORD expression indicates the background color stored in RRGGBB format and the index of the skin ( ID parameter ) in the last 7 bits in the high significant byte of the color. For instance, the BackColor = BackColor Or &H2000000 indicates that we apply the skin with the index 2 using the old color, to the object that BackColor is applied. 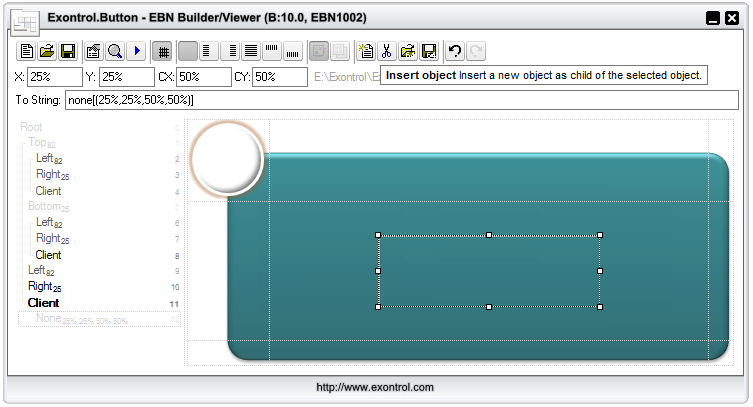 Currently, the ExEBN builder may show one or more panels, such as Designer, Background, Zoom and Test. 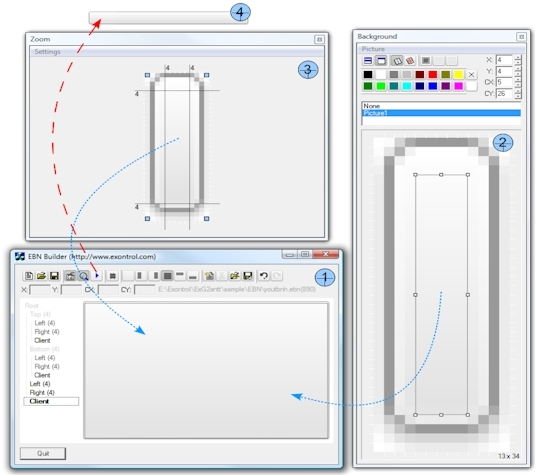 The Designer is the main panel of the tool that displays elements that composes the EBN file/object. In the designer, you can add/remove/update any element in the EBN composition. The Background panel displays the list of pictures / solid colors that may be applied to any element in the EBN composition. The Zoom panel can be used to collect and fill the EBN elements from a screen shot, or zooming/shrinking a portion of your screen. The Test windows displays the current EBN to a separate window, and it is visible only if the Test button is clicked.